Before getting into the review of the material, I want to discuss the “controversy” among my friends regarding the medium of audiobooks. I LOVE audiobooks, and am constantly listening to one. I am also a very frugal person but have treated myself to a monthly subscription from audible.com; so for those that know me, this shows the depth of my enjoyment in listening to books. Even as a teen I owned a Walkman and listened to those terrible quality tapes which always seemed to come unwound (remember using a pencil to twist those little round holes?). Graduating to a huge disc player many years later felt like a lottery win. Imagine my delight when just two years ago I discovered the invention of a little thing called an iPod Touch and downloadable books! It was like catapulting from a Flintstone lifestyle right into the Jetsons. When I talked about both reading and listening to 52 books this year, I was shocked to hear the opinion that listening to an audiobook was not reading, and should not count. I am still baffled at this belief. I think both are viable ways in which to become engrossed in a story. One of the arguments against audiobooks was that since I listen while engaged in other activities (i.e. treadmill, cleaning), I am not fully absorbing and therefore not getting the complete value of the material. My counter to that was when I read a book I am a very fast reader, and when tested once, I am part of the population which apparently skips little words (in, the, and) but still gets the content. Also, a narrator sets the pace of an audiobook, versus the reader who (let us all admit) can sometimes skip ahead in either a particularly exciting scene where you just have to know the outcome, or a boring scene that is not keeping your attention. So, how did this debate of the century conclude: It’s my blog, my rules. Audiobooks count as reading. 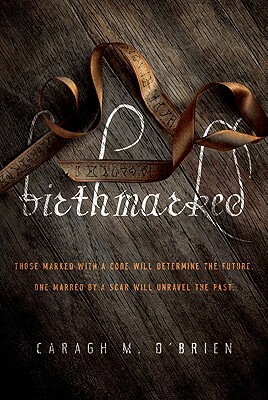 To the story of Birthmarked – it was okay. I like dystopian fiction, and even as a middle aged Mom, I really enjoy young adult fiction. There is something nice about knowing that the material is not inappropriate. I had high hopes for Birthmarked based on the premise of the story – a futuristic society which sounds shockingly like the Middle Ages. There are two groups in this world, those who live inside or those who live outside the wall. This is a story about a young midwife from outside the wall, what happens to some of the babies, the haves and have-nots and a twist at the end which gives insight into why the outside babies are meaningful. Why did I not enjoy the book? I cannot say. The story was good, premise was interesting, in this case the narrator painted great pictures with her voice and inflections, but something just didn’t click. There are two more in the series, and although they’ll remain on my reading list, I am not sure when or if I would pick them up. Here is an interesting piece of data to use in the audiobook is a book debate – I know that if I were to read the next two books I would not use the audio format. Why? I can check out paperbacks from the library and I wouldn’t want to invest anymore money into this series given my opinion of the first book.